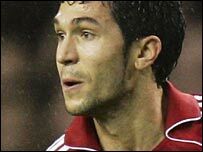 Liverpool midfielder Luis Garcia has joined Atletico Madrid on a three-year contract, as striker Fernando Torres moves in the opposite direction. The 29-year-old Spain international is believed to have signed for a fee in the region of £4m. Garcia joined Liverpool from Barcelona in 2004 and helped the Reds win the Champions League but has been out injured since January this year. He has played 121 games in three years for Liverpool, scoring 30 goals. Garcia ruptured the anterior cruciate ligament in his right knee during January's extraordinary 6-3 Carling Cup defeat by Arsenal at Anfield.